Ah, but see, I didn’t look everywhere for it. I merely looked everywhere an adult may have thought to put it, or leave it after cleaning. I forgot about the little gremlin living in our house and her…imaginative…sense of design. 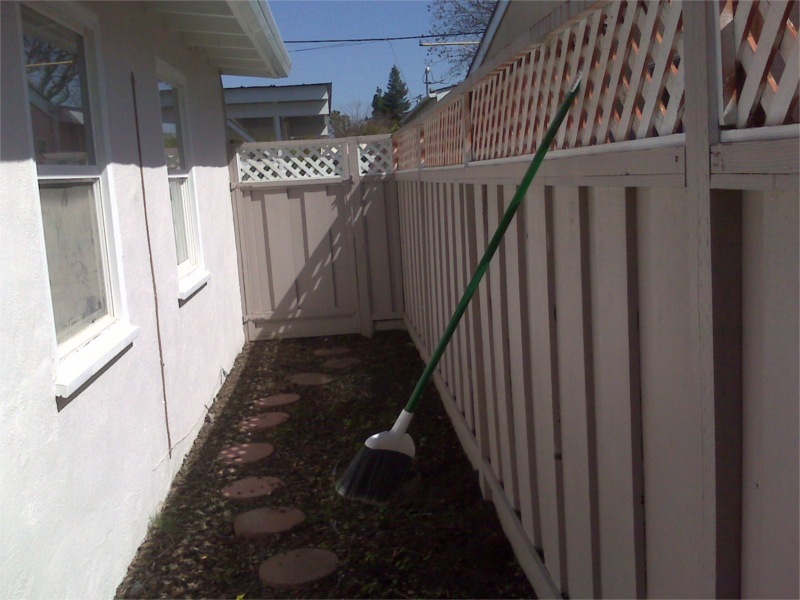 If you were looking for a broom would you think “Maybe it’s around the side of the house sticking out of the fence?” Oh. Really? So, this kind of thing happens all the time? I think I may have just figured out where the Roomba went: there’s a tomato planter hanging above the front porch that looks like it might have needed a robotic cleaning device dumped in it. Vanity, Thy Name is…Hey, What The Hell Is Your Brother Doing? Please, please, hold your applause. All your compliments on my parenting are making me blush. Author Shawn BurnsPosted on 04/07/2010 03/20/2011 Categories Photography, Ridiculousness1 Comment on Vanity, Thy Name is…Hey, What The Hell Is Your Brother Doing?